Is Sushi Actually Good for You? We Asked a Nutritionist. While most food trends come and go (looking at you, sriracha), sushi continues to rise in popularity each year -- seriously, see for yourself. America's love affair with sushi dates back to the 1980s, but is all this fish and rice actually good for us? To find out, we asked nutritionist Karen Ansel for a straight-up explanation of just how healthy sushi is. Let's cut to the chase: is sushi healthy, or not? Hell yeah it is: sushi's a great source of omega-3 fatty acids, which are a type of heart-healthy fat that most of us don't get enough of. Fish is loaded with the stuff, and experts recommend consuming two servings of fish per week, but most of us only consume around half of that. "Sushi is a simple way to up your seafood intake," said Ansel, "especially since you don't have to cook it." It's not just omega-3 either: the seaweed that wraps your sushi has tons of iodine, which improves thyroid health, and it's also a good source of vitamin A "which keeps your immune system strong, and your skin healthy." If you're not in the mood (or position) to roll your own sushi at home, you might also consider adding it to your takeout order rotation, "taking the place of less healthy choices like pizza or burgers." 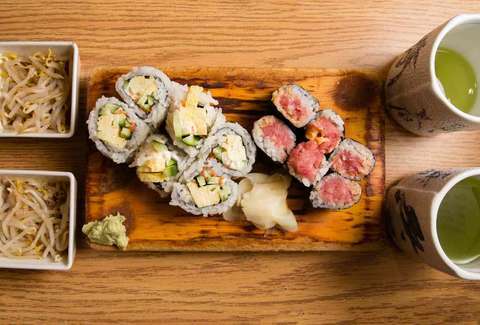 Just make sure you're cognizant of which sushi rolls pack the most calories before you place your order. Great! So I should eat it every day, right? Slow down there, turbo. While sushi undoubtedly packs a nutritional punch, you should be wary of overdoing it: Ansel suggests sticking to one or two servings per week, tops. "Sushi can harbor bacteria that can cause food borne illness, especially for children, pregnant women or people with weakened immune systems." 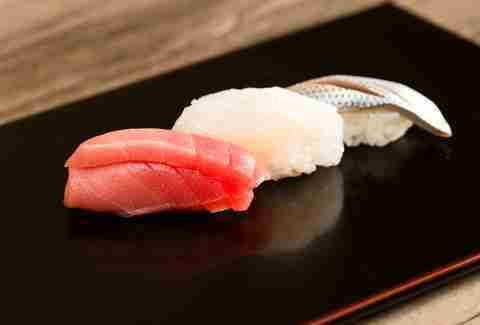 Even worse, consuming too much sushi can potentially lead to mercury poisoning, "especially if your sushi contains high-mercury fish such as ahi or big eye tuna, swordfish, shark, or tilefish." That said, if you avoid these higher-risk fish and restrain yourself from eating sushi every day, week after week, you should be safe from turning into the Mad Hatter. Shouldn't everyone be eating sushi? Not necessarily. According to Ansel, "Sushi can harbor bacteria that can cause foodborne illness, especially for children, pregnant women, or people with weakened immune systems." Also, if you're not partial to seafood in the first place, Ansel suggests going a less fishy-tasting route with something like grilled salmon, "which has a meaty texture and can easily be camouflaged into dishes like fish tacos."